So, koala with a rocket launcher or parrot with a flamethrower? Gorilla with an uzi or rhinoceros with a katana? Terrier with a landmine or cheetah with a sap? 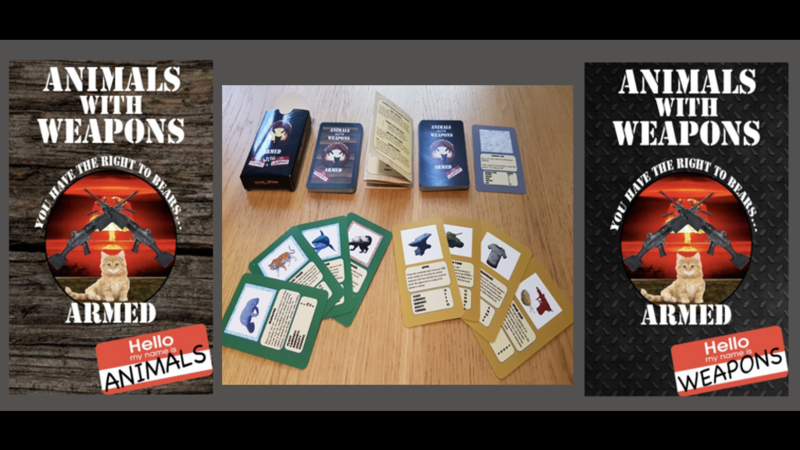 The answers to these questions can be found in Animals with Weapons, a new card game up on Kickstarter. This game started as a discussion between friends more than a decade ago, but came to life during a leisurely stroll around a wildlife park about a year and a half ago. Watching the animals roaming their (simulated) habitats, we couldn't help but wonder how it would all go down if the cages were opened and the wee beasties tumbled out into the middle of some sort of open-air armoury. Sure, we all know who'd win in a scrap between a bear and a shih tzu, but what if that puppy was packing heat? The Kickstarter campaign is up and running now.